Iraq's main Sunni Arab alliance has threatened to start a campaign of civil disobedience if concerns about attacks on its community are not addressed. The Iraqi Accord Front called for Interior Minister Bayan Jabr to resign, the disbanding of militias and the release of all Iraqi detainees. The demands came as the governing Shia and Kurdish alliances discussed the formation of a coalition government. Negotiations began after the results of December's election were announced. The Shia-led United Iraqi Alliance (UIA) took 128 of the 275 seats in the new Council of Representatives - 10 short of an outright majority. The Kurdistan Alliance (KA) won 53 seats and the Iraqi Accord Front 44. Wednesday's talks were attended by Iraqi Prime Minister Ibrahim Jaafari and Abd al-Aziz al-Hakim of the UIA; and Iraqi President Jalal Talabani and Kurdistan Regional President Massoud Barzani of the KA. 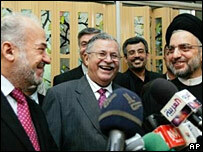 "This invitation was to strengthen the national unity and achieve peace... for all Iraqis," Mr Hakim said. The two alliances spent much of the day discussing who would control the key ministries in the new government. The Kurds want one of their leaders to be president and, after the meeting, Mr Talabani said the KA had agreed to nominate him once again for the largely-ceremonial post. The Shia parties want the premiership and the interior and defence portfolios, as they will control Iraq's security forces. Mr Hakim, the leader of the Supreme Council for the Islamic Revolution in Iraq, said he wants his deputy, Mr Abdel Mahdi, to be prime minister. Mr Abdel Mahdi narrowly lost out to his UIA-colleague and Islamic Daawa Party leader, Mr Jaafari, after elections for the Transitional Period last January. Mr Jaafari wishes to be re-appointed, but his transitional government has been widely criticised for poor performance and discrimination against Iraq's Sunni Arabs. Suspension of the tasks of the Interior Ministry security units, "which target innocent people on the pretext of pursuing terrorists"
Release of all prisoners in the prisons run by multi-national forces, "especially women"
Publication of the findings of the investigation conducted into the Jadiriya detention facility, where 170 prisoners, some showing signs of apparent torture, were found by US troops in November. Mr Hashimi said the government and the US-led coalition would have a chance to respond to their demands, but that they should not take a long time.